A frisky blend of orange and lemon, this soap is frosted with gentle waves of fluorescent glitter, marbled in pinks, tangerines, and even a flash or two of marigold. Perfect as a wake-up-call in the mornings, or simply a means of brightening the day, the juicy scent of Main Squeeze will electrify the sluggish hours and ready you for the liveliest rendezvous. Behind the decadent appearance and lush, gentle lather, you won't find any harsh chemical preservatives. Finchberry soaps are made from natural, food grade, gluten-free, and vegan-friendly ingredients. 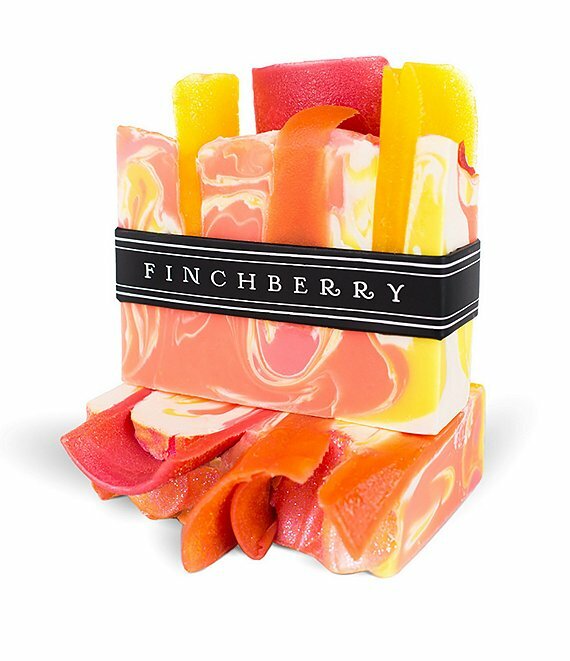 Finchberry soaps are not only cleansing, but provide a sensory experience to be savored daily.